Shopping for pillow cases seems easy on the surface. But not all pillow cases are made the same. Good quality pillow cases don’t irritate your skin, or rub off color on your bedsheet. They are super comfortable, soft and crisp and you feel fresh when you put your head on the pillow every night. You don’t have to worry about microbes and allergens sticking to your pillow case and causing any irritation or allergies. 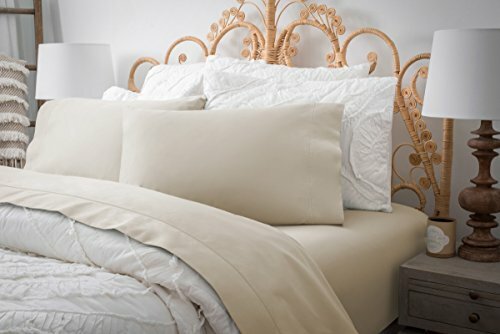 ​What to Look For in Pillow Cases? Cotton - People buy cotton because it is soft and cool to sleep on. It is absorbent so your face won’t sweat during sleep. The drawback is that it will shrink after washing and wrinkle easily. Cotton also comes in various types but Egyptian Cotton is of the highest quality among all types. It is also the softest. Because of its quality, Egyptian cotton is costlier than other types of cotton. Silk - Silk is a protein fibre that looks and feels premium and sensual. 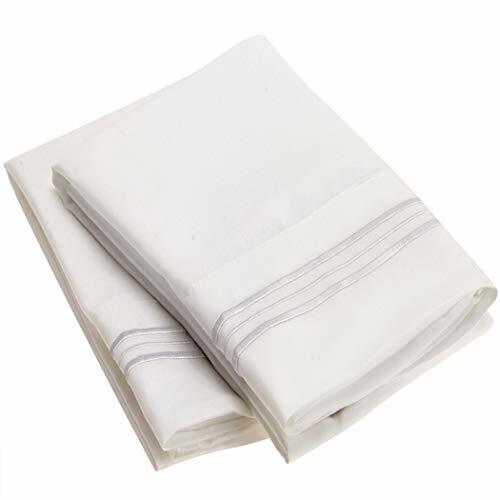 If you buy a silk pillowcase, you will need to get it hand-washed because of its delicate nature. The weight unit that is used to measure silk quality is called momme and good silk is 19 to 25 mm in momme weight. Polyester - Polyester is a popular material used to make bedsheets and pillow cases. But it is not absorbent like cotton, so manufacturers mix it with cotton to make it work for customers. Microfiber - A fibre is called microfiber when its diameter is less than one denier. Microfibres are made from wood pulp, polyesters or nylon polymers. Thread count is often used as an indicator of fabric quality, but it is not a true indicator. Thread count is the total number of threads per square inch in a fabric. Most people say that the higher the thread count, the better. But industry experts suggest that to achieve a higher thread count, manufacturers use lower grade cotton too. As a rule of thumb, experts recommend that you should always prefer cotton over other fabrics because it is breathable. Size isn’t a big problem, but can be overlooked when buying pillow cases. Make sure your pillow inserts go with the size of the bed. So on a standard bed with 38 inches in size, you can put two pillows of 24 to 26 inches. Base your choice on whether you have an allergy that could be triggered by the fabric. There are many hypoallergenic pillow cases in our list. So go through this guide carefully and consider all factors. For instance, people with psoriasis should avoid certain fabrics or they will face flare ups. How the pillows look on your bedding matters. A poor match can make your bedding look hideous and feels bad when you come back to your bed after a long day. Pick what suits your taste and matches the rest of your bedding - solid colors or designs - whatever catches your fancy. Some fabrics like silk have to be hand-washed while others can be machine-washed. Some pillow cases are wrinkle resistant and don’t need ironing, while others have to be ironed after wash. So based on your preferences, choose the right option. For those of you who want to spend thrice the usual amount on pillowcases for added comfort, smoothness and luxury, celestial silk pillowcases will suit the best. They are made form 100 percent mulberry silk and that too, the highest quality one. The 25 Momme mulberry silk has a very high amount of silk per square inch. Silk is a natural anti-aging fabric and keeps your skin healthy, smooth and moisturized. These are hypoallergenic so if you have any allergies or breathing issues you don’t have to worry about them. The best part is that the Celestial pillowcases are machine washable which is not what you usually expect with silk. The fabric is Oeko-Tex certified for having no chemicals inside it. It is pure silk. The pillowcase comes in a high quality box with a signature of the person who wrapped up the pillowcase - nice personal touch. It also protects your hair from drying out or looking messy in the morning. You won’t have any hair loss either. 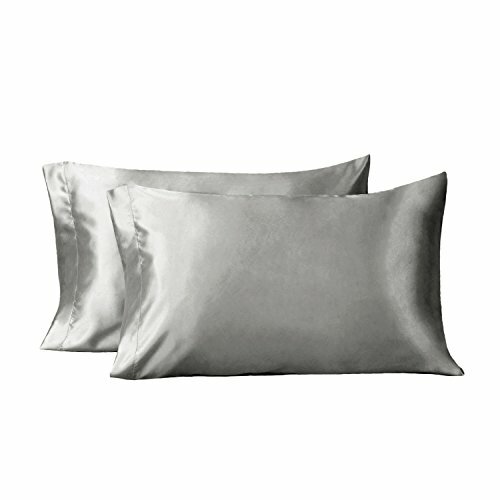 Bedsure two pack satin pillowcase set is made of 100% polyester satin. Satin is the weave of the fabric and not the fabric itself. The fabric is non absorbent and the satin pillowcases minimize the amount of hair damage or loss. Polyester doesn’t get wrinkles, so you don’t have to worry about ironing this one. The satin keeps your body cool in hot weather and warm in cold weather. But a slight caution - do not bring ear rings, rings or hang nails near these pillow cases or they will snag. The standard size of Bedsure Satin Pillowcases is actually standard size unlike other brand pillow cases. They will fit your pillows perfectly. They don’t give you a sweaty feeling and are cool to touch. Wash them in cold water and they will dry up completely wrinkle free. There is no zipper closure at the end, instead the company has provided an envelope closure which looks good and feels super comfortable. Overall, the Bedsure pillowcases are good value for money. But as customers report, after repeated washes, the thickness and silkiness gets reduced. 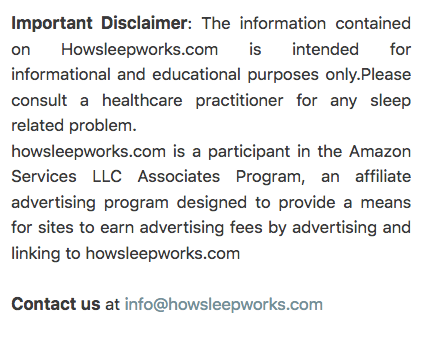 However, their overall reviews indicate that the Bedsure Pillow cases are worth it. No hair fizz. Smooth satin keeps your hair untangled. Sizing is accurate and three sizes available - king, queen, standard. Pinzon Signature Pillowcases are made with 100% cotton, which means they are absorbent and your face won’t get sweaty in the morning when you wake up. The fabric is woven with a double napped finish on either side. Hence, both sides feel soft. You can wash and dry the Pinzon pillow cases in your washing machine, so it won’t take extra effort in maintenance. They will last a long time as the flannel is made from 100% combed cotton. The combing process of the flannel ensures that all the uneven fibres are cut off from the weave and only the stronger ones and longer ones make the weave. There is also a one year warranty on these so you don’t have to worry about them tearing up out of nowhere after a couple washes. Do check the warranty terms though as it is limited warranty. You can choose either a king or a standard size in the Pinzon pillowcases. 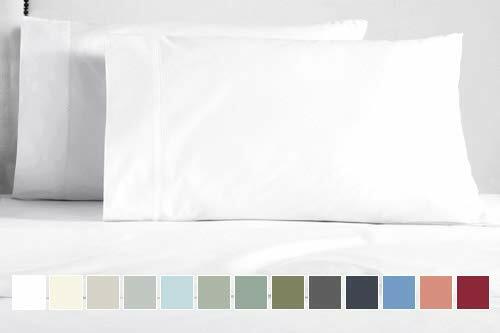 There are six colors to choose from, so you can pick the one that suits the rest of your bedding. The breathable fabric ensures that you sleep at the right temperature throughout the night. The standard size comes as a set of 2 and includes two pieces of 20-by-31-inch pillowcases. 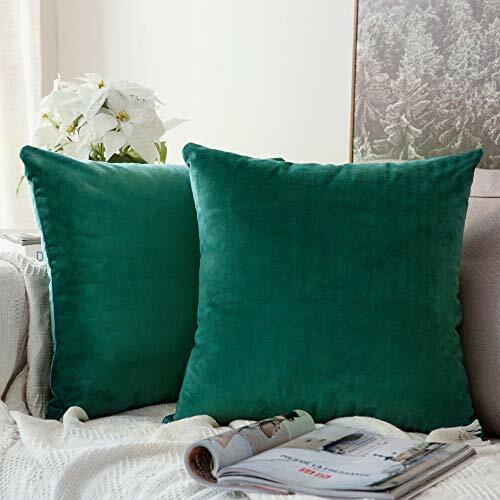 Miulee Pillow Covers are made from 100% Grade A velvet. The material is soft and comfortable. It is abosrbent so you won’t feel sweaty during the night. There is no hair loss with this fabric also. The material is such that it doesn’t stimulate the skin. So it is not harmful to children or your pets. When it comes to aesthetics, Miuelee has done a good job. The zipper is invisible and comes in the same color as the pillowcase. There is a lot of options when buying the Miuelee Pillowcase. You can choose from 24 colors and 5 size options. The colors are a tad shiny but that is what you expedct from velvet. A little glitch is that the zipper is almost half the size of the side of the pillowcase, so it is hard to push thick cushions inside. The colors are also accurate, so what you see on the website is what you get. American Pillowcase has made high quality pillowcases using 100% Egyptian Cotton. The material is hypoallergenic, and consists of long staple yarns woven in a sateen fashion. This is the reason they feel so soft and expensive. The pillowcases are machine washable so there is no extra effort needed to wash them. Use cold or medium water to wash. The thread count is 300 which is good, but we have explained earlier in this guide how thread count can be a false indicator of quality. Your money is secured as the company provides 100% money back guarantee with no questions asked. The 4 inches hems on these pillowcases make them look beautiful. They are also durable as the material is high quality and it comes with double stitching as well. The pillowcases are big in size and there will be spare room after you put the inserts. The blue color, however, is a little paler than what is shown in the photo. So keep this color discrepancy in mind while you buy them. They are highly durable, highly comfortable and require little maintenance. California Design Pillowcases are made from 100% Long Staple Pure Cotton. The thread count is 400, which is good but as we explained earlier thread count is not a good indicator of quality, specially if it is too high - like 800 or 1200. The yarns for these pillowcases are made with pure cotton and woven in a staeen weave to preserve the softness and make them durable. The material is fade resistant, so you won’t see the color change after washing. Oeko-Tex has certified the material to be free of any harmful circumstances. The fabric also performs good in terms of pilling, shrinking, color fastness, thread count, and tear strength. 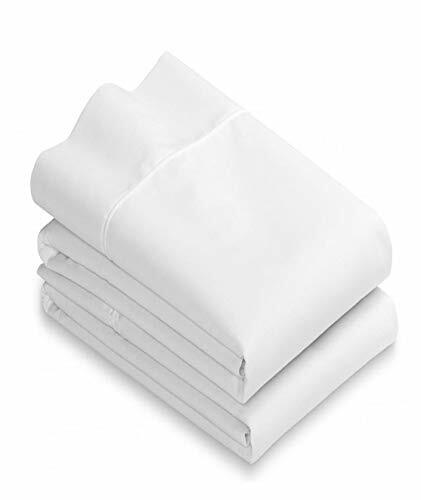 One drawback as reported by some customers is that these pillowcases may get wrinkles after washing, so you might need to iron them often. But if you don’t dry your cotton on high heat, it won’t be damaged or get wrinkles. The colors are very accurate so what you see on the website is what you get. 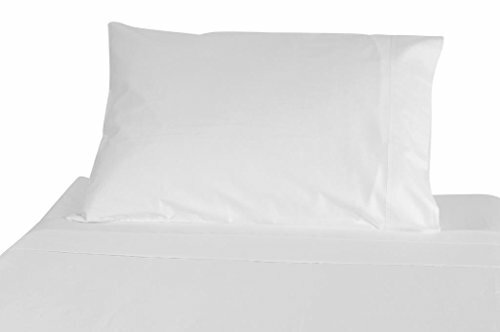 White Classic makes one of the highest quality cotton pillowcases. But keep in mind that in this product, the material is 60 percent cotton and 40 percent polyester. The company gives a set of 2. The fabric is still good and protects your skin against allergies, acne or breakouts as it is hypoallergenic. The pillowcases are machine washable and don’t lose color or quality after washing. The product comes with a 30-day money back guarantee, so you don’t have to worry about quality. These are 2 inch hems, not bigger - which is not clear in the picture you see on the website. The stitching is good quality and they easily fit thick inserts. There is a little starchy feel to them and they may shrink a bit after washing, but there are no major complaints. The color is true white and the quality seems good so much that they will last a very long time. These are really really white, so wash them with care. 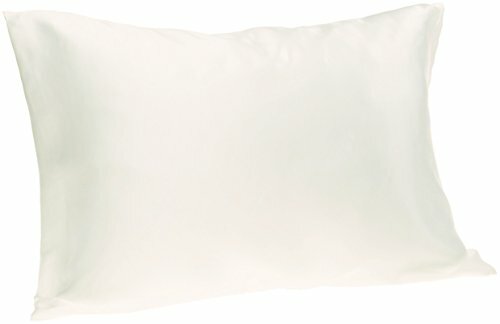 If you don’t like mixing polyester in your pillowcase fabric, the Pizuna 100% Cotton pillowcase will do the job for you. The hem is 4 inches. These are machine washable and fade resistant. So you don’t have to worry about the color changing or fading after washing. The thread count is 400, but again we explain earlier how thread count can be manipulated and is not a true indicator of quality. These are made from 100 percent long staple cotton and woven in satin. Of course it is 100 percent cotton, so the material feels soft and breathable. Cotton is also absorbent so you won’t feel sweaty during the night. Your purchase is risk free as the company offers full refund if you are not satisfied. The colors are not accurate to the ones shown in the photos, so be careful there. They can get wrinkles after wash, so you may need to iron them to keep them wrinkle free. There is no struggle in putting them on a thick pillow. You will forget the wrinkles though once you realize how comfortable they are at the price. The best part is that they can go through multiple washes and still look brand new. Magnolia Organics Estate Collection makes one of the better pillowcases in the market. THe fabric is 100 % organic cotton. The cotton is high quality and made in a sateen weave. So it is absorbent and won’t make you sweaty at night. It is also breathable and will feel good on your skin and won’t cause any irritation or allergies. The pillowcases are machine washable so you won’t need to waste time washing them by hands. Wash them in warm water and tumble dry with low heat and they come out brand new after each wash. Thread count is 550 but don’t keep it as a measure of quality since thread counts can be manipulated. 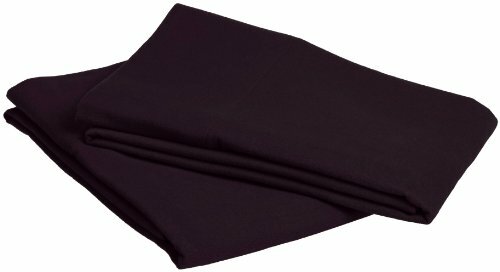 Customers report that the Magnolia pillowcases feel exactly like the expensive 800 tc 100% cotton pillowcases that come at a $200 price. They are very soft but obviously don’t feel a silky feel as they are thick. If your body tends to get hot easily, you won’t feel any problem on these as they are highly breathable. The thickness and quality is such that they will last a very long time. They are made through a process which is completely chemical free, so you won’t get any allergies or inflammations from this fabric. The only improvement that the company could make is that they could provide a money back guarantee on the purchase. 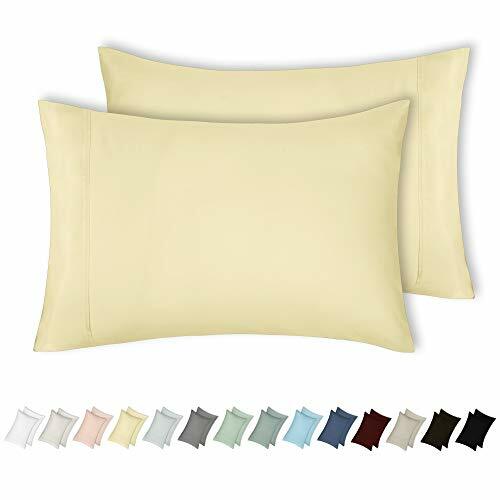 Overall, the magnolia pillowcases don’t have any faults that will prevent you from buying them and these are one of our favorites on the list.